Three Egyptian judges and their driver were reportedly killed on May 16 just hours after the courts announced preliminary death sentences against the ousted former President Mohamed Morsi along with 105 other people. These capital sentences have been sent to Egypt’s grand mufti, as stipulated by national law, for legal review. The mufti’s decisions related to the death penalty sentences are non-binding. The Egyptian court will issue a binding verdict on June 2, leaving open some avenues for an appeal. Another judge in the microbus carrying them was severely wounded. The judges were traveling from Ismailia on the Suez Canal to participate in court sessions at Arish when assailants in three vehicles fired on the victims while they were being transported. Violence has escalated in North Sinai over the last two years since the military ouster of the Freedom and Justice Party led government of Morsi. An organization called the Ansar Beit Al-Maqdis has been accused of carrying out the attacks against natural gas installations and security personnel. Nonetheless, high ranking officials within the current Egyptian regime have accused the Muslim Brotherhood of being involved in the attacks in North Sinai, a charge the organization has denied. On May 18, the Minister of Parliamentary Affairs and Interim Minister of Justice, Ibrahim Al-Heneidy, said that the Muslim Brotherhood was behind the instability in the region. 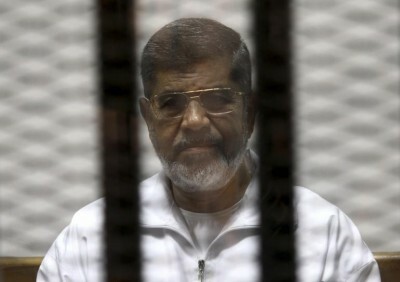 Former Egyptian Muslim Brotherhood President Mohamed Morsi was given the death penalty along with 105 others for a series of alleged offenses including breaking out of prison during the waning days of the regime of former President Hosni Mubarak. Between January 25 and Feb. 11 the Egyptian people rose up in rebellion against the Mubarak government and this jailbreak by Morsi and his colleagues coincided with the actions that led to the military seizing power after 18 straight days of mass demonstrations. In addition to the criminal counts related to the escape from detention under Mubarak were charges of supporting Hamas, the Palestinian resistance movement which holds nominal power in Gaza. Tunnels located on the border of Sinai and Gaza has been bombed repeatedly by the Israeli Defense Forces as well as the Egyptian military even during the tenure of President Morsi. The current Egyptian government under former military leader Gen. Abdel-Fattah El-Sisi has designated both the Muslim Brotherhood and Hamas as terrorist organizations. Many of the defendants sentenced to death on May 15 were members of Hamas. Although the U.S. State Department has said that it does not support the death sentences, the Obama administration is continuing its aid to the Egyptian government to the tune of $1.5 billion directly every year. The Pentagon and the Central Intelligence Agency (CIA) coordinates its activities in North Africa and the Middle East with the Egyptian regime. Egypt’s government of President Abdel-Fattah El-Sisi has become even more authoritarian and compliant with U.S. foreign policy objectives in the recent period. Egypt’s role in Yemen and Libya has sought to bolster Washington’s foreign policy objectives through Cairo’s alliance and dependence on Saudi Arabia and the GCC. The El-Sisi administration has extended its involvement in the ongoing Saudi-GCC alliance which has been bombing Yemen since March 26. Several thousand people have been killed and the U.S. government is providing intelligence coordination and refueling of fighter jets, many of which are manufactured by the American defense industry. In 2011, after the collapse of the Mubarak presidency, Egyptian Special Forces participated in the rebel insurgency against the Jamahiriya under Col. Muammar Gaddafi in neighboring Libya. Over the last few months Egyptian war planes have bombed Libyan territory adding to the destabilization of the country amid the chaos engineered during the last four years by Washington and Brussels. This role for the North African state was exemplified recently by the Washington Institute for Near East Policy’s published recommendations for future U.S. policy in the region placing emphasis on Egypt as being a pivotal country for stability in the Middle East. The report was written by a number of functionaries of the U.S. military and intelligence establishment including Samuel Berger and Stephen Hadley, both former national security advisors, James Jeffrey, a former ambassador to Turkey and Iraq, Dennis Ross, a former White House special envoy for Middle East peace, and Robert Satloff, the director of the Institute. Acknowledging the violations of human rights in Egypt today, the report suggests that the only way to engage the El-Sisi government on these issues is within “the context of an ongoing U.S.-Egypt relationship”. The authors urge even stronger military ties between Cairo and Washington.